Perhaps the greatest luxury of modern man is the home-cooked meal. While there are numerous ways to cook, there is no invention that can compare with the modern cooking range. When your range is broken, simple things like boiling water or scrambling an egg can become impossible. At Tiger Mechanical, we specialize in both high-end and consumer grade range repair. Our fast and professional technicians are factory-authorized to work on most high-end range brands including Air King, Alfresco, Avanti, Bertazzoni, Bosch, Blomberg, DCS, Gaggenau, ILVE, La Canuche, La Cornue, and Thermador as well as other popular brands such as Maytag, Whirlpool, Kenmore, Viking, and more. 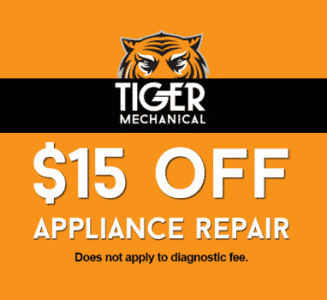 Tiger Mechanical is a leader in range repair in Maricopa County. With an A+ rating from the Better Business Bureau and over 25 years of field experience, Tiger Mechanical offers a 5-year warranty on parts and 1-year warranty on labor to ensure that your issue is resolved correctly in as little as one visit. We Service Throughout Maricopa County! Don’t see your city listed? Give us a call and we’ll let you know if we service your area. Learn more about the areas we service. Terminology can become confusing when discussing ranges, stoves, and ovens. The stove refers only to the stovetop, which typically consists of four to six burners. A stove is used for surface cooking like boiling, frying, sauteing, etc. The oven is an enclosed device used for baking, roasting, and broiling. The range is a combination unit consisting of both a stove and an oven. Ranges come in two primary types based on their heating method: electric and gas. Electric ranges heat metal coils to apply heat directly while gas ranges produce controlled flames for heat. Other problems may include issues with your stove top display including the clock or timer. Newer models often display error codes. These can sometimes be reset simply by unplugging and re-plugging the machine, but for persistent errors, you should call a factory-certified professional.